The 2013 golf season kicks off tonight for Tiger Woods and Rory McIlroy in Abu Dhabi1. Coming off of a solid 2012, Tiger is looking to break a 5-year major slump. 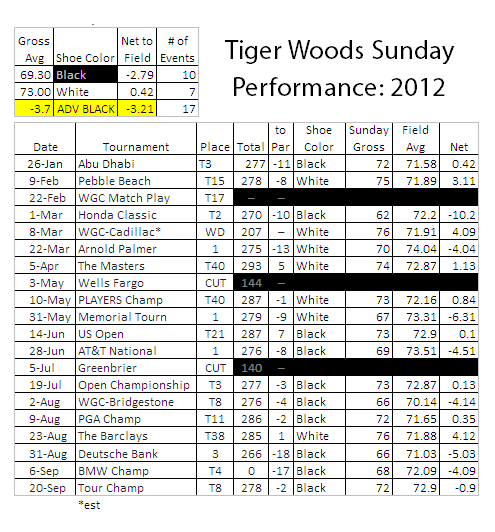 In order to close the deal on Sundays, I have one suggestion for Tiger: wear black shoes. For every final round, Tiger sports a red shirt with black trousers. 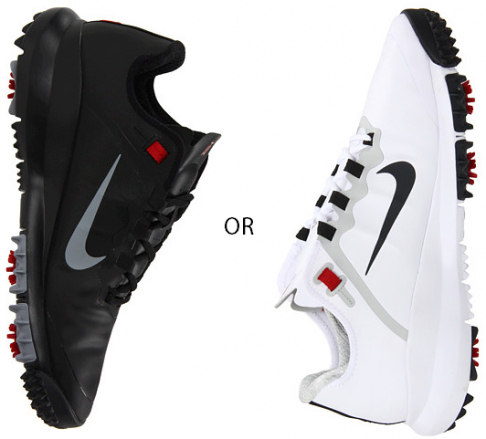 To begin 2012, he started wearing his new Free-inspired golf shoes. Some Sundays, he paired the black pants with white shoes, sometimes black. In addition to looking foolish wearing white shoes with black pants, there is highly suggestive data that indicates performance is markedly improved with the black shoes2. Despite this overwhelming data regarding shoe color, the more telling behavior here is the performance in major championships3. Here, he averaged .43 shots above the field on Sunday, never beating the field. Comparatively, for the three victories, Tiger’s Sundays bested the field by almost 5 shots. 2. Data is clearly not significant. It only measures 17 events, of which, the back half are loaded with black shoes. Tiger was 0.3 shots better in the second half of the year net to field. 3. The Masters, US Open, Open Championship, & PGA Championship. On this date 10 years ago, the most accurate account of the plight of high school swimmers everywhere was released. Swimfan, featuring Parenthood star Erika Christensen, showed the plight that I, and countless other guys, had to endure as an irresistibly fit promising varsity HS swimmer. My favorite scene is the 200 free when Ben finishes at the opposite side of the pool from the starting blocks. Yep. As they did last year, DirecTV is releasing an NFL Sunday Ticket app for the PS3 which provides live streaming of every out-of-market game and the Red Zone channel, which features scoring plays of all games. It is available now, just in time for the start of the season. The cost is $299, which is a $40 price cut from last year. The Olympics are Over, but You Have to Watch This…. Watch until the end. The best 3 1/2 minutes in sporting commentary ever.